I must admit, I'm a big fan of the Pantone Color of the year; Tangerine Tango! It's bright, fun, and festive and can be paired with a wide range of colors to create an amazing event. I like the idea of pairing it with golds for a more elegant affair and browns for a more rustic feel. 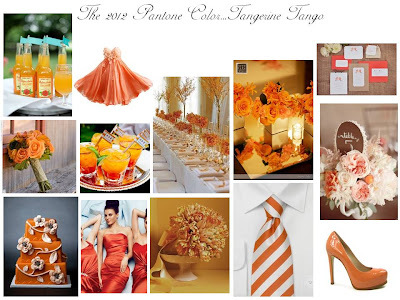 From a fun and flirty reception dress to gorgeous florals, here's an inspiration board to get you in the planning spirit and prepared for a color that's sure to be seen a lot in 2012!